Penalty shoot-outs, sponsored walks and cake sales were among the fundraising activities when Tauheedul Islam Boys’ High School set about raising money for Sport Relief this week. Together pupils, staff and parents raised over £1,800 for the charity – a total to be very proud of. Our student council worked hard to organise a variety of activities that took place every day in the run-up to Sport Relief on Friday 23 March. Made up of boys from all year groups, the student council organised and ran a lunchtime cake sale, while Year 7 and Year 8 pupils took part in a sponsored walk through Sunnyhurst Woods in Darwen. 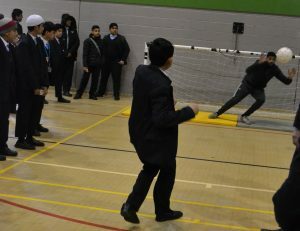 Staff took up position in goal each lunchtime as pupils made donations to take part in penalty shoot-outs. A team of TIBHS staff took on a team from Star Academies in a five-a-side match which ended in triumph for the TIBHS side. Spectators from the school and the Trust made donations to watch the spectacle. TIBHS’ week of Sport Relief fundraising culminated in a non-uniform day on the last day of term, Friday 23 March. TIBHS’ Principal Majid Ditta said, “Our pupils really embraced the opportunity to raise funds for a national appeal that supports young people both in the UK and overseas. The student council took a lead in organising the activities and charity collections – and did a wonderful job! The week has given our pupils another opportunity to demonstrate our STAR values of service and teamwork particularly as they worked together to raise funds for a very worthy charity – having lots of fun in the process. We are delighted that TIBHS has been named as one of the top performing secondary schools in the country in KS4 performance tables. Access all the latest tool and utilities to help with your projects.